Are trains the best way to travel with children in Europe? I think so!! “Happiness is a journey not a destination” is especially true in Europe where train travel is scenic, convenient, and comfortable. Children aren’t confined to their chair by seat belt, families can share a packed lunch or a card game, and there's no need to stop for bathroom breaks. In most countries, local travel on regional trains is cheap and requires no advance reservation or purchase. International travel, however, is usually provided by high-speed trains such as the TGV (French), ICE (German) and Thalys (French, Belgian, and German) and these DO demand a reservation. A very popular website in the U.S. for buying European railway tickets is Rail Europe. Normally their prices will be competitive, but it doesn’t hurt to price compare by checking your itinerary on one of the many national railway websites such as FS (Italy), DB Bahn (Germany), RENFE (Spain) or SBB (Switzerland), for example. 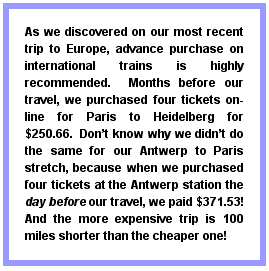 We’ve actually gained significant savings at times by booking the same ticket through DB Bahn instead of Rail Europe. But again, no need to pre-buy regional, town-to-town rail tickets – keep your itinerary flexible. If you’re planning lots of multi-city or especially multi-country rail travel with your family, or especially if you are a young backpacker, you’ll want to look into the dizzying selection of European rail passes. You’ll find global passes, regional passes, youth passes, family passes, saver passes, and many more at Eurail.com. Their website will walk you through how to select the best pass for your destinations, duration, group size and age. European train travel is fabulous!!! Love your posts! !